On April 22, countries around the globe will celebrate Earth Day in an annual push to activate the environmental protection movement worldwide. As consumers become more socially driven, corporations are challenged to address ways to make their operations more sustainable and eco-friendly. On Earth Day, companies should evaluate their sustainability efforts and ensure their offices are environmentally conscious. 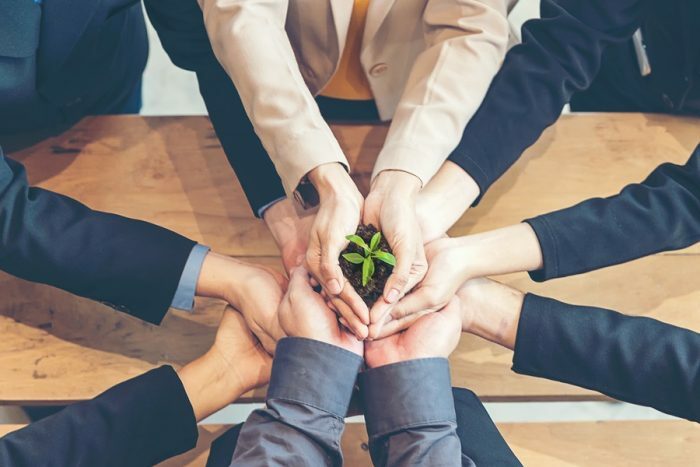 Besides benefiting the environment, many eco-friendly actions are good for business by reducing company spend and fostering office camaraderie and teamwork. At 25.9%, paper and paperboard products represent the largest portion of all waste, according to the U.S. Environmental Protection Agency. Eliminate using and purchasing these products. Digitize company operations by electronically sending clients contracts and notices, moving to a digital document management system, and communicate via email. Invest in permanent silverware, cups, and plates for the office kitchen, as well as a water cooler, which will be more cost-effective in the long run. If you must purchase single-use items, go for biodegradable or compostable options. They don’t cost much more than plastic when purchased in bulk — an Amazon search showed compostable cups cost $45 for 500 cups. You may be wondering, isn’t our recycling program enough? While admirable, recycling programs are a reactionary Band-Aid solution to our dependency on single-use materials, and many experts doubt that the cost is worth the effort. Their usefulness is particularly questioned now that China has been refusing imported recyclables from the U.S. since 2018, meaning a lot of these items head to landfills anyway. A stronger solution is to end the need for recycling. Meat consumption is a significant contributor to environmental pollution. Cattle alone account for 20% of overall U.S. methane emissions. Host a veggie-centric lunch at the office. The lunch will surely please your vegetarian employees and will raise awareness of the impact meat consumption has on our environment. Take it a step further and host meatless Mondays lunches once a month to keep the momentum going beyond Earth Day. Make Earth Day a designated day for Volunteer Time Off (VTO), or paid time off for volunteering, specifically for eco-friendly activities like planting a tree or cleaning up litter. Employees can pursue their preference independently, or the office can organize a group activity. Partner with organizations like Arbor Day Foundation, which has tree-planting programs in urban and rural areas. Research shows that socially conscious companies tend to have better employee engagement and retention. Employees who work for purpose-oriented companies have 20% longer tenure than those who don’t. Foster employees’ deeper connection with Mother Nature by adding a few plants to the office (certain types do just fine even in low light). Studies show that spending time near plants makes people happier and healthier, reduces mental fatigue and aids concentration. Plus, the plants will purify the office air, doing a small part in offsetting companies’ carbon footprint. Becoming environmentally friendly doesn’t need to involve a financial investment or business overhaul. A few minor changes can make a world of a difference and have a positive impact on the atmosphere within companies’ offices.